The Frances Letter Pendant is a sweet little pendant for Southern girls of all ages. Heavily plated in 14k gold or silver, this pendant will be your go-to piece for any occasion. 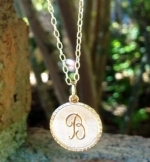 Featuring our small initial charm, you may choose from our list of available initials. Chains are offered in 16 or 18 inches.